Google is synonymous to innovation, creativity and thinking-outside-the box. Google seem to be everywhere right now. It is represents freshness and new ideas. One of the engineers of Google, Singaporean Cheng-Meng Tan who calls himself Jolly Good Fellow wrote a book that would inspire people to achieve success, happiness and (Chade’s personal mission: World Peace). 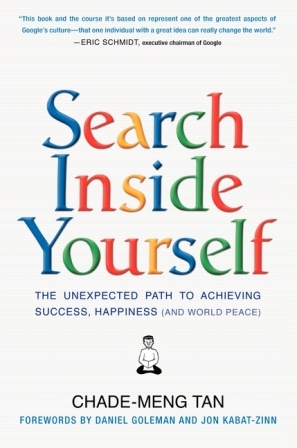 He wrote the book entitled Search Inside Yourself which is the same name of the course he also teaches in Google. An engineer who teaches about self-motivation and meditation, yes, that only happens in Google. Being an engineer, Chade-Meng Tan approaches the goal of success, happiness and confidence in a very technical way. He analyzes the workings of the mind to get the desired solution. Reading this book, you can pick Meng Tan’s brain. You can really tell that he really is a ‘Jolly Good Fellow. He practices positivity. He stated that ‘Happiness is a default state of mind. Happiness is not something you pursue, it is something you allow. Happiness is just being’. Inside the book are scattered cartoons with funny conversations that make you laugh while you read the book to offset the some of the serious technical discussion of understandng the processes of the mind. Meng Tan is very insistent in the power of meditation. He swears by its magical powers when practicing mindful meditation. He promises it yields wonderful results. He said the importance is intention. He likened the mind while in mediation as a guard standing at the gate of the city watching people go in and out the city gates. He advised us to be aware of our attitude towrads ourselves and how we treat ourselves. He encourages that our attitude towards others should be shifted towards kindness and curiosity. I know that meditation can be tricky. It means keeping our mind relax and active at the same time and not allowing thoughts to stray. Meng Tan motivates us to start even just 5 minutes at day and see the results. Maybe if we all do practice this joyful mindfulness and zest for positivity and happiness, we all would be forgoing Prozac, successful in our chosen careers (hopefully become millionaires) and achieve the world peace that seem so unreachable nowadays.